Alana Jones is a Houston native. As a founding member of Vitacca Dance Project under the direction of Kelly Ann Vitacca she trained under Ballet Master Phillip Broomhead while attending the High School of Performing and Visual Arts. In 2014 Ms. Jones was accepted on scholarship and trained with the American Ballet Theatre and Dance Theatre of Harlem. Thereafter, Ms. Jones was accepted on scholarship to SUNY Purchase Conservatory of Dance. During her time at Purchase College, Ms. Jones was invited into the ballet concentration where she performed and studied works by George Balanchine, Norbert De la Cruz, Michelle Ulerich and Colby Damon. During her four years she has also trained with Ballet X, Complexions Contemporary Ballet, The Rock School for Dance Education, Hubbard Street Dance and Arts Umbrella. Alana recently earned her BFA and is excited for her first season with Chicago Repertory Ballet. Felicity Lyon Nicholson began her formal dance training at the Fort Wayne Ballet under the direction of Karen Gibbons-Brown. She then went on to receive a BFA in Dance Performance from Butler University, during which time she performed works by Gustavo Ramirez Sansano, Susan McGuire, Derek Reid, Patrick Hinson and many others. Upon graduation Felicity moved to Chicago where she studied on scholarship at Visceral Dance Chicago and at the Lou Conte Dance Center and performed work including Thodos Dance Chicago’s New Dances, Schaumburg Dance Ensemble’s The Nutcracker, and the Moroccan tour of BDE’s Scheherazade. In 2016 Felicity became a member of Project606 Dance and Trifecta Dance Collective, where she was made Rehearsal Director in 2017. After performing Gerald Arpino’s “Light Rain” with the Fort Wayne Ballet in the Fall of 2018, Felicity is delighted to be back performing in Chicago for her first season with Chicago Repertory Ballet. 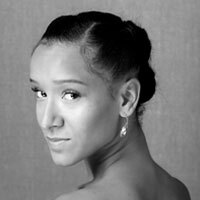 Ms. Marley was born on St. Croix in the U.S. Virgin Islands, training in the Cecchetti Method with Sonja Dickerson-Faust and Heidi Wright. She continued her training under the direction of Peter Stark with the Orlando Ballet School and was accepted into the trainee program at age fourteen, performing in the corps de ballet alongside the professionals. Ms. Marley was invited by the legendary Fernando Bujones to join the company in 2004 and danced with the company for the next six seasons. That same year she became part of the Orlando Ballet School faculty, teaching various levels and adult ballet classes regularly. In 2009 Sarah partnered Silver Medal winner, Brooklyn Mack, at the Helsinki International Ballet Competition. Ms. Marley has also danced with the San Diego Ballet, Company C Contemporary Ballet, the San Diego Opera and Smuin Ballet. Through the course of her career Ms. Marley has performed soloist and principal roles in classical and contemporary works by Marius Petipa, George Balanchine, Twyla Tharp, Michael Smuin, Maurice Causey, Helen Pickett, Bruce Marks, Amy Seiwert, Patrick Corbin, Kenneth von Heidecke, and Garrett Ammon among others. This is Sarah's first season working with Chicago Repertory Ballet . Mauricio Fernandez is originally from Mexico where he received his early training at Estudio de Danza Antoinette de Puebla. To further his dance education abroad he attended, on full scholarship, the Boston Ballet School, Orlando Ballet, Gelsey Kirkland Academy of Classical Ballet in New York City, Idyllwild Arts Academy and Milwaukee Ballet. He also received full scholarships offers to the American Musical and Dramatic Academy (AMDA), Atlanta Ballet, Ballet Austin, Cornish College, Festival Ballet Theatre of Providence, Joffrey Ballet School in New York City, Nashville Ballet, Pittsburgh Ballet Theatre, National Ballet Academy of Denver and Texas Ballet Theatre. He has performed with several ballet companies including Compania de Danza Antoinette in Mexico, InlandPacific Ballet, Orlando Ballet, Western Chicago Ballet, Hinsdale Ballet Theatre, Springfield Ballet, Albany Berkshire Ballet and most recently with the Kentucky Ballet Theatre. Mauricio is a Tap Gold medalist at Confederacion Inter-Americana de Profesionales de la Danza (CIAD), Intrancefest Tec de Monterrey and received first overall at several international dance competitions. He was a semifinalist in the Spotlight Awards of the Music Center of Los Angeles in 2012 and of the Youth America Grand Prix in 2015. In 2013 Mauricio received the Youth of Mexico Award for his achievements in the arts and has been recognized by AGMA as an Artist of Extraordinary Ability. He is currently working as a guest dancer, teacher, choreographer, and national dance adjudicator. He’s on faculty at Impact Dance Company and Virtues In Motion as well as Celebration Talent Convention and Star System’s Shock The Intensive. Mauricio is looking forward to his first season with Chicago Repertory Ballet. Meet Your Summer Intensive Faculty! Study with this amazing faculty in Ballet, Pointe, Variations, Contemporary, Improvisation for Ballet, and CRB Repertoire for a fun and challenging week of dance in the heart of downtown Chicago, Don't miss your chance: Register today! We sat down with Summer Intensive Instructor Luis Vazquez to discuss his ideas on dance and teaching. Enjoy reading about his perspective below! CRB: Luis, can you tell us a little about your history with teaching? Luis: "My teaching experience really flourished when I joined Thodos Dance Chicago. While in the company I taught company class, master classes while on tour, and re-staged company repertoire during summer and winter intensives. Since then I've taught at the Joffrey Ballet Academy, After School Matters, and teach group fitness." CRB: What would you say is important learn in the studio? Luis: "We have one body, it is up to dancers to be able to learn the mechanics and capabilities of their specific facility. As a teacher, I do my best to push students to see the dance room as a laboratory; constantly experimenting with how their body can use momentum to push through space, and grow." CRB: What is your favorite part about teaching? Luis: "I love seeing a dancer take ownership of their artistry and really tear through space, it's extremely rewarding to help students reach that point and grow into professionals." CRB: What do you think is unique about the CRB Summer Intensive? Luis: "The CRB intensive is special because of the diversity of the repertoire. Students can strengthen their classical technique, and learn how that technique can be filtered through contemporary work." Work with Luis and the rest of this amazing faculty in the CRB Summer Intensive August 6 - 10. Send in your audition video now! We sat down with Miriam-Rose to talk about her philosophy on teaching, life and artistry. Please enjoy our interview with Miriam-Rose! CRB: "Tell us a little bit about your teaching background." Miriam: "For the past four years, I have been on faculty at The Joffrey Academy of Dance. I have given master classes and taught throughout the Midwest at the Jacobs School of Music, the Beverly Arts Center, and The Academy for the Arts in Spring Arbor, Michigan, among others." CRB: "In your words, what would you say is your teaching philosophy/approach?" Miriam: "As a teacher, my aim is not only to train my students to be the very best dancers or musicians they can be, but also to equip them with the skills and values necessary to become the best possible versions of themselves. I love the arts of both ballet and violin for many reasons; one of which is that in order to do them well, one must develop perseverance, discipline, passion, humility, creativity, and patience, among other qualities. These qualities are valuable not only in the arts, but in any person’s life, and I aspire to enhance and shape the lives of my students." CRB: "What do you personally enjoy about teaching? Miriam: "I love being able to pass on the tools and technique required to execute an artform well. When you see a student who really wants to succeed, who puts in the work, and is able to see their improvement in class, onstage, through an audition, etc., it is so rewarding!" CRB: "What do you think is unique about CRB's Summer Intensive program?" Miriam: "CRB is unique in its versatility. Not only do we dance and perform a myriad of styles, but each of the teachers at this intensive have diverse backgrounds and so much to offer from our variety of artistic experiences. You won't want to miss it!" CRB: "Tell us something fun about YOU!" Miriam: "As I implied above, I also play the violin! I started when I was six years old with the Suzuki violin method, and am still performing, teaching, and writing my own music today." Don't miss your chance to study with Miriam and the rest of our wonderful faculty in CRB's 2018 Summer Intensive. There are still spots available. Find out more below!